We opened our doors in June 2012 and have built up a really loyal customer base. Our customers have literally made friends within the shop! Our location is perfect for those using public transport. We are also buggy and wheelchair friendly with two level entrances and plenty of space inside to manoeuvre. 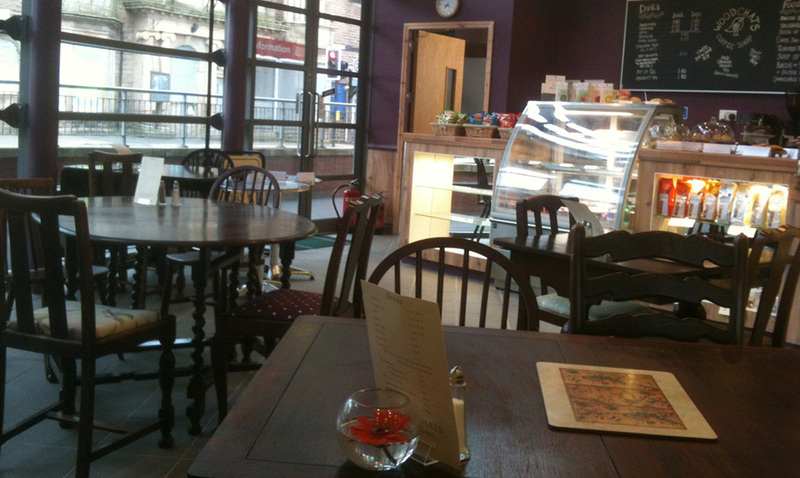 Our coffee is roasted and supplied by Exchange Coffee in Blackburn. We use their GTA Award winning Espresso Creama to brew our espressos, cappuccinos, lattes and americanos. We also have great filter coffee for those in a rush. Our coffee is made to your taste, if you prefer it strong just ask for an extra shot at no cost. If you prefer it weaker, ask for half a shot. You can also personalise your coffee with one of our range of Monin syrups. Our tea is freshly brewed in a pot and served with vintage china cups and saucers. 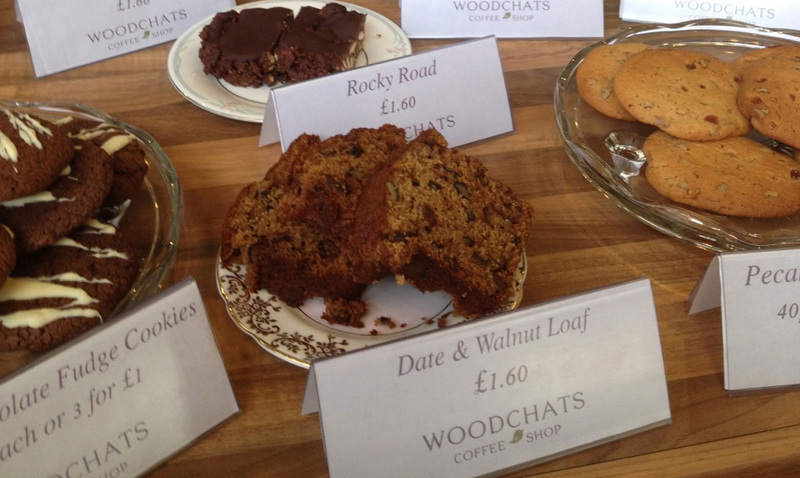 All our cakes, cookies, tray bakes and cheesecakes are made daily on the premises in our little kitchen. All of these are available to eat in the shop or to take away. Cakes and cookies can also be ordered for special occasions. All our sandwiches and toasties are made to order, this means you can have them exactly as you wish on brown or white, with or without butter, additional salad, add a bit of cheese or chutney etc. We have a daily soup (at least 2 in the winter months). Our selection includes Leek & Potato, Tomato & Red Pepper, Lentil & Lemon, Butternut & Sweet Potato, Spiced Parnsip, Tomato and Basil, Garden Pea, Cauliflower Cheese, Carrot & Coriander, Winter Vegetable, Pumpkin & Red Pepper, Celeriac, Chunky Minestrone, Mushroom. New recipes/ideas are gratefully received! 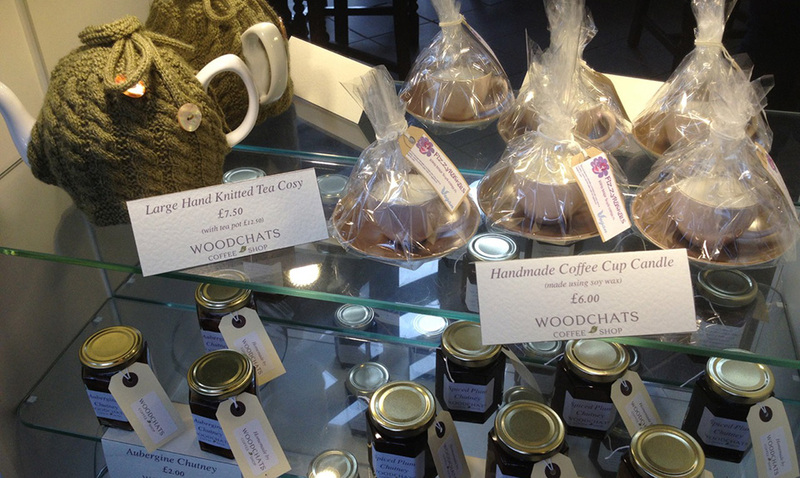 We also have a great range of homemade seasonal jams and chutneys. Our Spiced Plum Chutney is very popular and this is the one we use on our sandwiches. As much as possible we source our produce locally. Our cheese is Dewlay’s Creamy Lancashire, this is supplied by Pat’s Market Cheese Stall, Chorley Market. Our sausage and bacon is free-range and supplied by Heskin Hall Butchers. Our award winning Black Pudding & Haggis is supplied by Brown’s Butchers of Chorley. All our eggs are free-range and come from Sootys at Heskin. Our Fiddler’s Lancashire Crisps are made from potatoes grown just 10 miles away in Rufford. They turn their potatoes into fantastic crisp in a range of award winning flavours – Sea Salt, Simply Spuds (nothing added), Lancashire Sauce, Lancashire Sweet Chilli, Sea Salt & Lancashire Vinegar, Lancashire Cheese & Onion, Cracked Black Pepper & Sea Salt, Black Pudding & Mustard. The charity we have chosen to support is Rosemere Cancer Foundation. Rosemere raises funds for additional equipment and facilities for cancer patients being treated at the specialist Cancer Centre at Royal Preston Hospital and in the local Cancer Units throughout Lancashire and South Cumbria. They also invest in local cancer research. Through our everyday collection box, Easter and Christmas fundraisers and events we have so far raised almost £1300 which is something we really have to thank our customers for.